Donald Trump’s voice won’t be the only one heard at this year’s inauguration. Tens of thousands of people are preparing to hit the streets of Washington D.C. during the 45th president’s inaugural week. While some will march in support of the president or various causes, a growing number will be on hand to show their opposition to the newly elected president and his administration. The National Park Service has provided 22 permits for First Amendment events that will take place over inauguration week on park service land that includes the National Mall and the White House. Each protest ranges in size from 50 people to 200,000, however, any protest less than 25 people does not require a permit. “The permit applications we received this year are a considerable uptick,” Mike Litterst, public affairs officer of the National Mall and Memorial Parks, said, adding that they typically have only provided about a half dozen for past inaugurations. D.C.’s Department of Homeland Security and Emergency Management has been preparing for the protests and the inauguration crowds since April. They’re expecting 800,000 – 900,000 people to attend overall, which is significantly less than Obama’s inauguration in 2009 that drew 1.8 million and forced the city into gridlock. And the DHS will continue to examine hotel occupancy rates, buses and social media sites to try to gain a better understanding of the crowd’s potential size as initial estimates could change. Christopher Geldart, the director of the D.C. Department of Homeland Security and Emergency Management, said that 3,200 police officers from across the country will be on the parade route to provide security. Obama’s first inauguration had 2,500, and his second had 3,000. 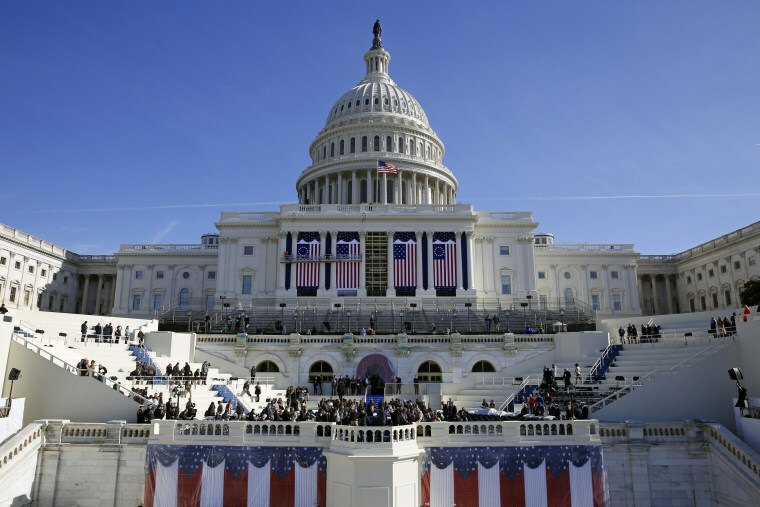 Inauguration security expenses are expected to exceed $100 million this year. The largest protest is expected to come the day after Trump’s inauguration. According to the permit they acquired for 200,000 demonstrators and the responses they've received via social media, the Women’s March on Washington is predicted to draw hundreds of thousands of protesters in the nation’s capital on Jan. 21, although there will be corresponding protests across the country. Bendat noted that the women’s march reflects a similar demonstration in the early 20th century. A day prior to the first inauguration of Woodrow Wilson, 5,000 to 8,000 suffragists got a parade permit and marched down Pennsylvania Avenue demanding the women’s right to vote. “If you think about it, that’s a lot of people for that era given transportation difficulties,” Bendat said. Ben Becker, an activist helping to organize the ANSWER Coalition’s two prominent protests along the inaugural parade route, said it is unsurprising that there is this much interest in demonstrations opposed to the incoming administration. While he said his organization applied for permits a year ago and planned to protest no matter the victor, entire communities were energized to share their disapproval of Trump. Like many protest organizations, ANSWER wanted to have a prominent position at the inauguration because, according to Becker, they wanted the world, international media and Trump himself to see their opposition. But some protesters don’t think being seen is enough. DisruptJ20 is a new organization that started organizing six months ago in preparation of the inauguration. Curated by local D.C. activists, the group aims to use direct intervention to interrupt the inaugural process. Interim D.C. Police Chief Peter Newsham said that the police were prepared for potential disruptions at the Inauguration and mentioned the size of the security presence, which will include 5,000 National Guardsman. Their hope is that they can engage potential activists and teach them how to effectively protest during the inauguration and in the future. Boris Epshteyn, the director of communications for Trump's inaugural committee, has stated in multiple interviews that protesters are well within their rights to demonstrate as long as they follow the applicable laws, rules and regulations, but the largest group demonstrating in support of Trump have a slightly stricter view. Bikers for Trump have a permit for 5,000 individuals, and, though the organization did not respond to calls for comment from NBC News, their president Chris Cox told Fox & Friends on Friday that they planned to put their bodies in the way of anti-Trump protesters. People are pouring into Washington in record numbers. Bikers for Trump are on their way. It will be a great Thursday, Friday and Saturday! "In the event we are needed, we certainly will form a wall of meat," Cox told the Fox News anchors about his organizations, which he said had grown as large as 200,000 members since it first formed 15 months ago. "We'll be shoulder-to-shoulder with our brothers and toe-to-toe with anyone," he added. Trump and his supporters have often dismissed demonstrations like the ones Carrefour and Becker are organizing, claiming that they are filled with professional protesters who are being paid to appear. Both Carrefour and Becker roundly rejected this accusation, which was made throughout the campaign by Trump and others with no evidence. All anti-Trump protesters shared the belief that inauguration day would only be the beginning, as they trust that the incoming administration will continue to take a hostile tone toward minorities and various other stakeholders. The goal is to start big and then take the organizing outside of Washington D.C. to smaller communities across the country.